Thanks to various agencies and international organizations, great progress has been made in recent years in bringing an ever-greater number of vaccinations to fruition in developing countries, principally primary immunizations for newborns and their boosters (tetanus, diphtheria, pertussis, polio, Hib, Hepatitis B). Besides these childhood infectious diseases, which have received great attention, there are many other illnesses that cause millions of deaths among children and adults but for which there are still no vaccines. As a response to this gap, international institutions, including W.H.O., the GAVI Alliance, the Bill & Melinda Gates Foundation, UNICEF and many others have developed more and more far-reaching global strategies and implemented strategic plans aimed at fighting infectious diseases through vaccinations. These plans recommend and encourage the development of those vaccines for which there is a dramatic necessity in the poorest countries, finding the financial resources needed to introduce and support the vaccination plans for these vaccines in those disadvantaged countries where infectious diseases are endemic, involving local governments from the very start. 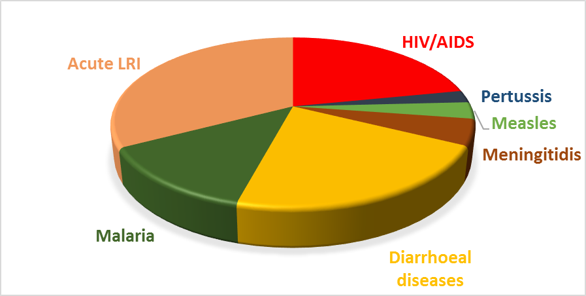 The Fondazione, from its perspective, has focused its activities on enteric infections, diarrhea and dysentery, that are are the first cause of death in children under 5 years of age, with a number of deaths estimated at between 1,350,000 and 1,800,000 as well as tens of millions of hospitalizations a year. At the same time, technology is advanced enough to allow the development of new, effective and sustainable vaccines against these diseases. What is needed is a champion to spearhead their development.